As markets, technologies and environmental issues become increasingly global in scale, so does policymaking. In this new reality, the distance between citizens and policymakers increases, thereby diminishing the citizens’ sense of ownership in decision-making. This creates a need for new initiatives to bridge the widening democratic gap. Citizens have to live with the consequences of climate policies. Their views should therefore be taken into consideration. Policies determined through international climate negotiations will mean that citizens will have to invest in new technology, develop new consumer patterns, modify their houses and even their livelihoods. They are more likely to accept and implement such policies if they have been consulted and listened to first. Until now, no systematic and in-depth global citizen consultancy on climate change has been organized. WWViews fills this void and establishes a model for the future inclusion of the world’s citizens in global policymaking. The novel and practical project design makes it potentially possible for all nations on Earth to take part and to produce comparable results that can be clearly communicated to policymakers. 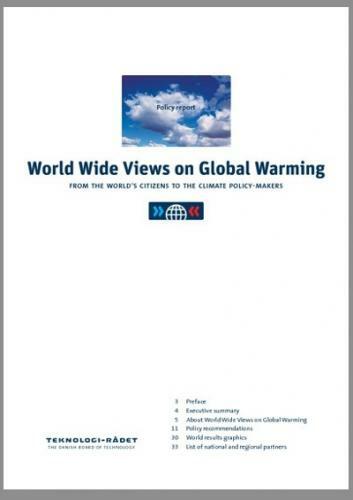 World Wide Views on Global Warming involved roughly 4,000 citizens in 38 countries spanning six continents. The citizens gathered in their respective nations to deliberate about the core issues at stake in the December 2009 UN negotiations on climate change. They received balanced information about climate change, discussed with fellow citizens and expressed their own views. They did so in daylong meetings on September 26, 2009. In the menu above you can browse through all the phases of World Wide Views on Global Warming as it was realized in 2008 and 2009 leading up to the United Nations Climate Conference in Copenhagen, December 2009. Compare your views with those of the WWViews participants and find out which country you resemble the most. The Danish Board of Technology - winner of ’The Jim Creighton Award’ 2010 for: random selection, deliberative processes, innovation and creative approaches, international reach and courage in public participation.